Discussion in 'Technical & Maintenance' started by fortech, Oct 10, 2014. I'm swapping out the headlights on my 640 for new LED's. I cut a template out of aluminum but realized yesterday I need some smaller hardware for one of the mounts, tough to get when you never go to town. Also putting new fairing and remounting the rallly nav gear on my 525 but I need to get it in to Keith to go over the electrics as I wasn't there when it all came off the first time. Hopefully getting to an offroad rally within the next year if I have any $$ left outside of getting to the Dakar. As for tire changers check out the No Mar system, I plan on putting one in the new shed when I get that built. It took a couple tries before I was able to get all the correct components, but with them finally in hand, I installed a set of Kuryakyn Highway Pegs on my Triumph Trophy today. They blend well with the Phantom Black paint, if I do say so myself, and will be a relief on those 600+ mile days. Having always thought that Kuryakyn was of Japanese origin, I had to laugh when I checked the packaging to discover that they are based out of NW Wisconsin, of all places. Touratech Zega Pro panniers and 1500 pelican thanks to Thop. Ordered the racks on Thursday, installed on Friday. 31 and 38liter? I would probably use mine on the Tiger if the offset racks didn't put the exhaust side box so far out in the wind. Figured I would see the 'dero in the background. The varadero is still there. Look how much nicer the exhaust tucks under the seat. And the pannier racks you can only barely see them! One risk of purchasing a discontinued motorcycle, albeit at a greatly reduced price, is that Triumph accessories are getting hard to find for my new Trophy. Fortunately, the folks at Triumph USA in Atlanta have been very helpful pointing me in the right direction. 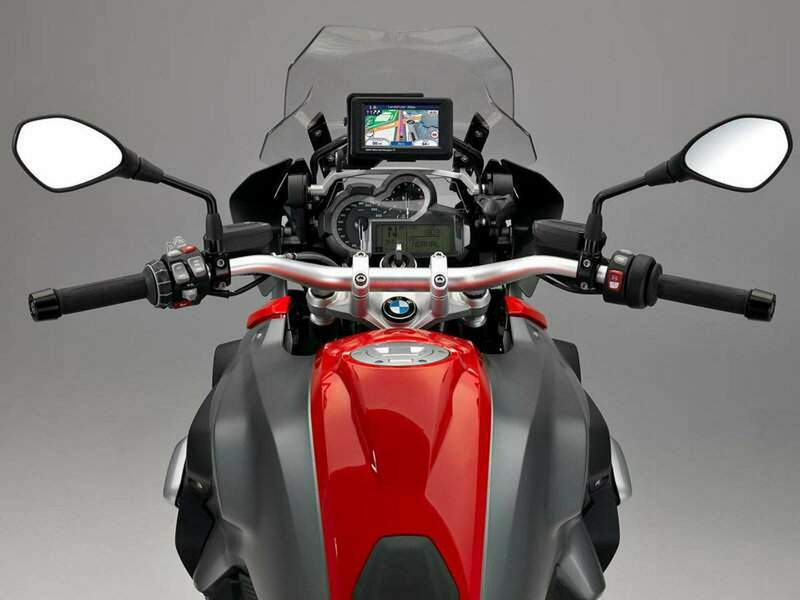 Triumph made a custom tank bag to fit for the Trophy that more or less copied BMW’s design for the R1200RT. It took four telephone calls to Dealers that supposedly had one left in stock before I found one in Simi Valley, California. Hard to beat the $78 price, that’s for sure, including map pocket and rain cover. All I had to do was attach the quick-release buckle to the front of the center cap, and I am good to go. Cheap and easy. I like that. And, the best part is the map pocket, so I can keep living in the past with my paper maps. Of course, these days that means I need to keep the spectacles handy as well. I need to do a brake and clutch fluid flush. Thought that might be a good time to swap out the el-cheapo plastic brake and clutch fluid reservoirs with a metal lever and reservoir combo like you see on most cruisers... lower profile, harder to damage etc. Anyone here done that and if so can you recommend a decent brand name? Can't help with the equipment question but I always try to push air up through the system. Decals replaced yesterday under warranty. Original decals on the white panels were oddly thick and them peeling is a common problem. KTM is aware of the issue and no trouble getting a full set of decals. Impact Design did the decal removal and install. They said it was the most glue they had ever seen on decals....and likely the reason they were oddly thick. If I was changing the reservoir I would pump the pistons out with the pads on so the fluid was down at the slave cylinders. Drain the reservoir and change it, then push the air up by pushing the pistons back in and "burping" the system. Then you can pump new fluid through the system without having to push air downward. It has been my experience that air travels upwards easier than down and on a bike with dual calipers there is sometimes a splitter that can be a PITA to get the air out of. What do you think about Speed Bleeders that incorporate one way check valves in them? I have had success using a “minivac” to draw the fluid out of the reservoirs, but it is a messy, mostly two person process. I agree with you that the plastic fluid reservoirs look pretty chintzy, but I have been told that they do a better job of dissipating heat and moisture than those sharp looking, low profile, billet reservoirs. A case of function over form, perhaps? Thanks Murph, I'll keep that in mind. I like the idea of speed bleeders as they turn it into a one person job but the only time I have needed a second hand on a fluid flush is when I am doing the front caliper on the clutch side and the length of reach for the GSA stretches me pretty far. Maybe... but why revert to touring/cruiser type on the LC? Maybe because fashion conscious consumers such as yourself demanded it in focus group discussions!